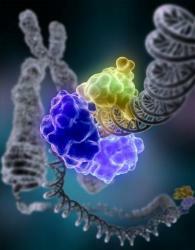 Once considered unimportant "junk DNA," scientists have learned that DNA that codes for non-coding RNA (ncRNA) — RNA molecules that do not translate into proteins — plays a crucial role in cellular function. Mutations in ncRNA are already known to be associated with a number of conditions, such as cancer, autism, and Alzheimer's disease. Now, through the use of "deep sequencing," a technology used to sequence the genetic materials of the human genome, Dr. Noam Shomron of Tel Aviv University's Sackler Faculty of Medicine has discovered that when infected with a virus, ncRNA gives off biological signals that indicate the presence of an infectious agent. Not only does this finding give researchers a more complete picture of the interactions between pathogens and the body, but it provides scientists with a new avenue for fighting off infections. Dr. Shomron’s findings were first published online on March 9, 2012 in the journal Nucleic Acids Research. "If we see that the number of particular RNA molecules increases during a specific viral infection, we can develop treatments to stop or slow their proliferation," explains Dr. Shomron. In the lab, the researchers conducted a blind study in which some cells were infected with the HIV virus and others were left uninfected. Using the deep sequencer, which can read tens of millions of sequences per experiment, they analyzed the ncRNA to discover if the infection could be detected in non-coding DNA materials. The researchers were able to identify with 100% accuracy both infected and non-infected cells — all because the ncRNA was giving off significant signals, explains Dr. Shomron. These signals, which can include either the increase or decrease of specific ncRNA molecules within a cell, most likely have biological significance, he says. Princeton University researchers have observed a self-degradation response to the antidepressant Zoloft in yeast cells that could help provide new answers to lingering questions among scientists about how antidepressants work, as well as support the idea that depression is not solely linked to the neurotransmitter serotonin. In findings published online on April 18, 2012 in PLoS ONE, researchers based in the lab of Dr. Ethan Perlstein, an associate research scholar in Princeton's Lewis-Sigler Institute for Integrative Genomics and senior lecturer in molecular biology, report that sertraline — trademarked as Zoloft — accumulated in the internal membranes of baker's yeast cells. This buildup caused a swelling and sharp curvature in the membranes of vesicles, bubble-like cell components with a hand in cell metabolism, movement, and energy storage. The vesicles then went into autophagy, a protective response in which cells recycle excess or damaged membrane. But yeast cells lack serotonin, which is the primary target of antidepressants, Dr. Perlstein said. By observing a reaction to sertraline in an organism that does not contain the drug's conventional target, Dr. Perlstein and his co-authors have found significant evidence suggesting that antidepressants engage in pharmacological activity beyond regulating serotonin. Dr. Perlstein worked with co-first authors Drs. Jingqui Chen and Daniel Korostyshevsky, as well as Dr. Sean Lee, all three senior research specialists in Dr. Perlstein's lab. Although antidepressants are known to regulate serotonin, it is not completely understood how antidepressants interact with the body's brain cells and what effect, if any, this activity has on treating depression, Dr. Perlstein said.